We’ve just been notified that you MUST make reservations in advance, whether for a private van or shared transportation. Cancun Airport Authority has a strict policy that prohibits Best Day from accepting payment at the airport for ground transportation. To make your reservation call 1-800-593-6259 and request the TBEX rate. In just a little over a week, travel bloggers and representatives of the travel and tourism industry will be flying into Cancun International Airport for TBEX North America 2014. With the support of TBEX Cancun sponsor Best Day, we have arranged a deeply discounted price on ground transportation for TBEX attendees. The reduced rate will be available for ground transportation to and from the airpot and hotels located in the Hotel Zone. Private vans should be resered in advanced by calling Best Day at 1-800-593-6259 and requesting the TBEX rate. This makes sense if you know the arrival times of your friends and colleagues, and can bring the price down as low as $11-12/person, depending on van size. For shared transportation, no reservations is required. To take advantage of this great discount, you’ll need to go to the Best Day desk at the Cancun Airport. After you arrive at the airport, and process through customs and immigrations, you will proceed out of the secure area into the lobbyof the international arrivals. Ignore all the drivers shouting for your business, proceed to the Best Day desk and tell them you’re attending TBEX. Their friendly staff will get you fixed right up. If you don’t see a Best Day desk inside, step outside and find someone holding this sign and they’ll help you out. Best Day will have a desk at the Moon Palace Arena, our conference venue, and you can make arrangements there for a departure shuttle. You do not need to purchase round trip transportation to take advantage of this great discount. 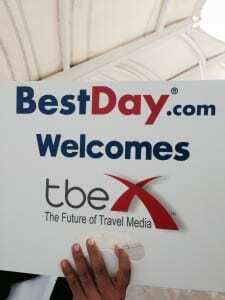 If you’re staying in the Cancun area for awhile, and have interest in transportation for other explorations, Best Day is offering other discounts for TBEX attendees. These can also be booked at the desk at the Moon Palace Arena. What (if any) transportation will be available to/from the Moon Palace conference venue for those attendees staying either at others of the hotels offering special TBEX rates, or other hotels entirely? Will TBEX attendees who aren’t staying at the Moon Palace be allowed to ride the Moon Palace shuttles to/from other Moon resorts, as a way to get to the daily conference sessions at the Moon Palace? So far as I can tell, the only option for those not renting a car is to take a collectivo to the end of the Moon Palace service route, and walk about a mile and a half to the resort. There will be a shuttle service connecting Moon Palace with a few other spots. We’ll get that info out to everyone just as soon as the route becomes available. Thanks, Mary Jo. That’s good news, and very helpful. The sooner we know at least generally what the shuttle stops will be (e.g. will they be only on the “Zona Hotelera” strip, or will there also be a stop in downtown Cancun such as at or near the ADO bus station?) the sooner we can know where it will be feasible to stay, and can finalize our lodging plans. I have a small update. There will be shuttles to Moon Palace (and returning) from three locations: Ibis Hotel (downtown), Cancun Convention Center (Hotel Zone) and the Marriott Hotel (Hotel Zone). As soon as I have details as to dates and times, I’ll publish an updated blog post. Too bad this information wasn’t provided weeks ago. Part of the reason why I am not attending TBEX North America 2014 has been the complete lack of information about simple infrastructure issues like shuttles. I know the area well and have been watching and waiting for this to be addressed. I guess I should have “trusted” it would be addressed at some point before 9/10. We’re sorry you won’t be with us in Cancun. We’ve had a lot of information come in this week, and we’re trying to get it out to attendees just as quickly as possible. We know that it’s rather late in the game, but we also know that our partners have been working hard to show attendees a great time. No, this is for airport transportation (and return). I’m working on a blog post about the shuttle route during the official events. thanks. by the way, for what it’s worth, there is also Super Shuttle in Cancun. Has anyone used HappyShuttleCancaun.com? It is $11.50 one way. I just called and they said it’s $13 one-way for a shared van and $70 for a private. Anyone else arriving on Wed? I just called Best Day and was told that there is no group or conference rate, they had never heard of TBEX. All I could get was the standard $26 round trip. I’m so sorry to hear that you experienced a problem. The Best Day team will be here on site and I’ll check with them later this morning. Thanks for letting us know you had an issue. Same thing happened to me. They have no idea there’s a TBEX rate. $26 round trip is what they offered. Which is fine, but I was transferred to 4 departments and took forever to arrange. Thanks for letting us know. I’ll look into it and see if there’s anything we can do to make it easier.